Secondly, if you guys like progress shots, I used two panels in this strip to describe my creation process in this forum thread on ComicFury. You'll have to click the spoiler tag to see it in full~ :) And check out the other artists' progress shots too! Have an awesome weekend, everyone! I'll catch you on Monday! EDIT: You guys might have noticed differences to the website. I've switched from the Simple Layout Editor to HTML now! This means pretty image buttons and, uhm, maybe not so pretty changes to parts of the website that were totally fine before. If you guys catch something weird, please report it! Sorry for my HTML-ignorance. >_< But thank you guys for your support! 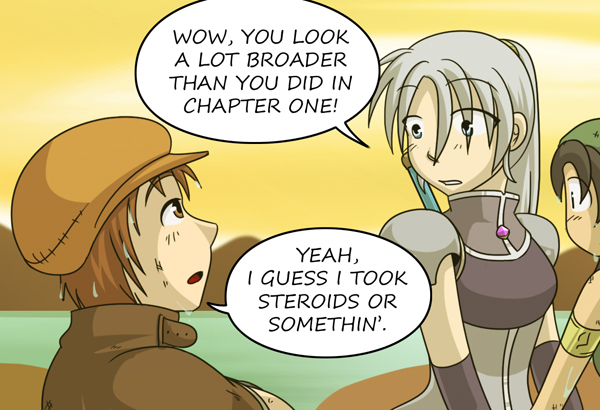 Just got done reading through the whole archive, yet another wonder webcomic added to my list of favorites! Keep up the good work! So worth it. A friend linked me your web comic and just finished reading the entire thing through. Its damn good and im excited to see what happens next. Keep up the good work! Aww!! <3 I like your friend!! XD Thank you! !